Art of Edina is an initiative aimed at giving rising and established Edina artists a public space to display their art. Some of our gallery art sources include: Edina Art Center, upper level photography and art courses at Edina High School, the Edina Community Center, clubs, churches, local professionals and hobbyists. Art of Edina is directed by Jill Emmer of Shine On Photos, LLC. Art of Edina is powered by Tradition Companies and is a part of the “Pass It On” initiative. So far, there have been a total of seven galleries around the Edina community. Congratulations to the students from Creek Valley and Highlands elementary schools that were chosen for our Art of Edina Southdale Gallery! The 30 pieces will be on display for the next 3 months. Partnering with the Edina Parks and Recreation Department, this Spring 2018 will be the fifth annual Braemar Arena Lobby Gallery. This "call for art" is open to any and all artists and no professional experience required. We love the variety and creativity that is submitted each year. The feature is located in the "Last Glance" section on pg. 64!! The article describes how local artist, Mary Vandervelde, captures the contrasts of spring and how she is inspired by Art of Edina's Jill Emmer. Way to go, Art of Edina!! 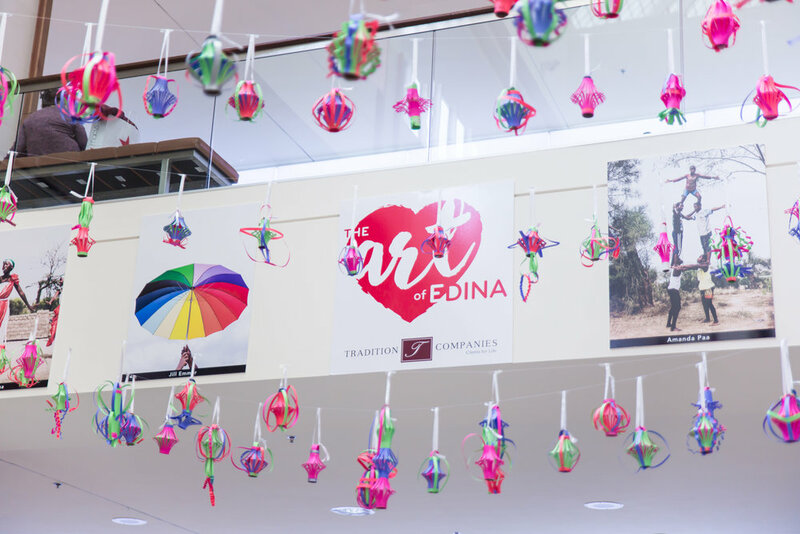 Art of Edina teamed up with Watts of Love and American Refugee Committee to create the Shine on Project. Shine on Project portrays the beauty and happiness of the refugees in the Nakivale Settlement. The travelers share their stories of this journey through photos. Phase two of the gallery features an installation of lanterns created by students of Our Lady of Grace Catholic School. The gallery includes photos that were taken in an Edina park or show park-like activities. The Art of Edina galleries have included drawings from young children, a painting from a local master painter and photos from many talented community members. You don't need to be a professional to participate! "Reinvention is always in fashion, and Galleria Edina is reinventing itself in a big way this fall with a 20,000 square foot expansion, which will include exciting retail and restaurant concepts and a dynamic, new entrance. Our Galleria Art Walls pop-up exhibit is based on the idea of reinvention – these colorful murals and interactive areas allow anyone and everyone to reinvent their reality with something as simple as a new backdrop. The artwork for this exhibit was designed and curated by Jill Emmer and Paul Johnson as part of the Art of Edina program, with help from local artists Matthew Custar and Chank Diesel. Art of Edina is funded by Tradition Companies." This gallery will be on display for a few months while the Galleria undergoes construction. Stop by and check it out! Abbey adored dragonflies, and that is the inspiration for this exhibit. The dragonflies were created by the second grade class at Concord Elementary. Art teacher Michelle Eronson oversaw the project. The dragonflies will remain on display for approximately three months. Stop by and check it out! The theme of this gallery was "Enjoy Your Parks". In 2014, Jill Emmer of Shine On Photos started a project on her Instagram (@Shineonyoucraydiamond) by mailing her beloved photography prop - a rainbow umbrella - to a fellow photographer friend. Soon after, more and more friends requested the umbrella. The Spring 2016 gallery was created with art from this project! The gallery was located in the center of the mall (on a facade built in front of the new Free People store) and was displayed for three months. Located at Braemar Ice Arena, this exhibit displayed 34 pieces from local Edina community members. This exhibit was on display from March to September of 2016. The artwork is created by students at Concord Elementary and was curated by Concord art teacher Elise Schmidt. This gallery supported the talented students of Concord and gave them a sense of appreciation by displaying their work. The gallery is located on the first floor of Southdale Center in the main atrium (just outside of Herberger’s).